NARRATED BY IVONNE COLL AND ANTHONY MENDEZ FROM TV’S JANE THE VIRGIN! 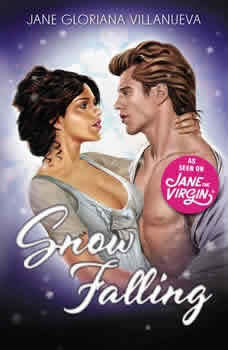 It’s been a lifetime (and three seasons) in the making, but Jane Gloriana Villanueva is finally ready to make her much-anticipated literary debut!Jane the Virgin, the Golden Globe, AFI, and Peabody Award–winning The CW dramedy, has followed Jane’s telenovela-esque life—from her accidental artificial insemination and virgin birth to the infant kidnapping and murderous games of the villainous Sin Rostro to an enthralling who-will-she-choose love triangle. With these tumultuous events as inspiration, Jane’s breathtaking first novel adapts her story for a truly epic romance that captures the hope and the heartbreak that have made the television drama so beloved. Snow Falling is a sweeping historical romance set in 1902 Miami—a time of railroad tycoons, hotel booms, and exciting expansion for the Magic City. Working at the lavish Regal Sol hotel and newly engaged to Pinkerton Detective Martin Cadden, Josephine Galena Valencia has big dreams for her future. Then, a figure from her past reemerges to change her life forever: the hotel’s dapper owner, railroad tycoon Rake Solvino. The captivating robber baron sets her heart aflame once more, leading to a champagne-fueled night together. But when their indiscretion results in an unexpected complication, Josephine struggles to decide whether her heart truly belongs with heroic Martin or dashing Rake. Meanwhile, in an effort to capture an elusive crime lord terrorizing the city, Detective Cadden scours the back alleys of the Magic City, tracking the nefarious villain to the Regal Sol and discovering a surprising connection to the Solvino family. However, just when it looks like Josephine’s true heart’s desire is clear, danger strikes. Will her dreams for the future dissolve like so much falling snow or might Josephine finally get the happy ever after she’s been dreaming of for so long?